The client who provided separate images of the airplane and the background commissioned the image shown. A composition was worked out by exchanging ideas in e-mails. The picture was then painted using acrylic paints on a 16” x 20” canvas. The entire process of making the initial sketches, preparing a layout from the photos and e-mailing the layout back to the client for approval took approximately 3 days. The painting was digitally photographed near the end of the process and sent by E-mail to the client. 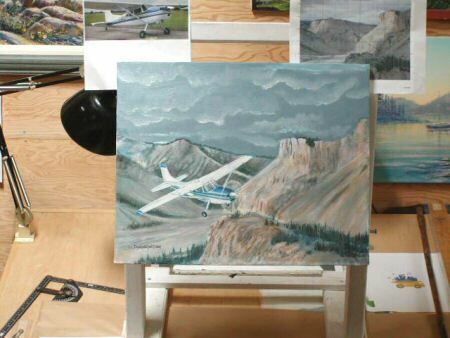 Images of any aircraft, in any position with landscape or skyscape backgrounds can be painted on canvas in any size. All that is needed are good photos of the subject vehicle, a description or photos of the background, as well as the size of the painting required. In some cases, the artist may have to do archival research or build a model of the subject aircraft so that markings and specific features can be accurately depicted. Although most orders can usually be filled within 30 working days of receipt of order, some commissions may take longer depending on research required. Prices are separately quoted on each individual commission. We also do scale models and relief cast wall art. Click To view my Aviation paintings.